Because drones ones are the cool new thing all the kids want to play with now at work — Amazon’s doing it, Google wants in, heck, even icefishers like’em — one TGI Friday’s in the UK is taking advantage of the drone craze to get diners in the mood over mozzarella sticks and potato skins this holiday season. The pilot project will take off at a Manchester TGI Fridays this holiday season, reports the Manchester Evening News, before it hits the air at selected locations around England. 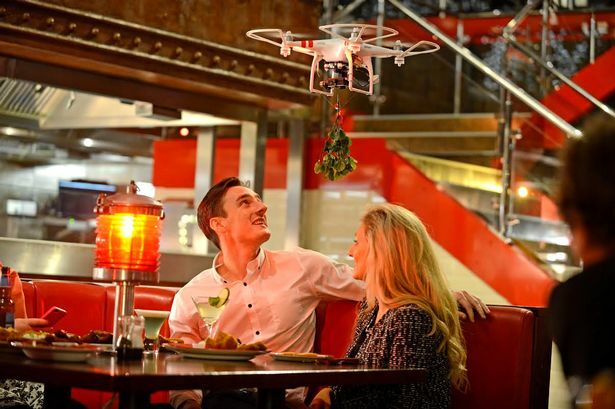 As for what makes these drones holidayish, no, they’re not buzzing customers with shots of eggnog or tooting out seasonal tunes — the drones will be carrying pieces of mistletoe and hovering over diners with a built-in kiss cam to capture all those romantic moments over appetizer combo platters and cheeseburgers. Delicious. “Everyone loves a good Christmas party, but we all know things can be a bit awkward until someone breaks the ice,” a spokeswoman explains, adding that Fridays is all about celebrating, so why not amp up Christmas and get shy diners some lovin’. This sounds like the perfect set-up for a perfectly awful romantic comedy and I want in.